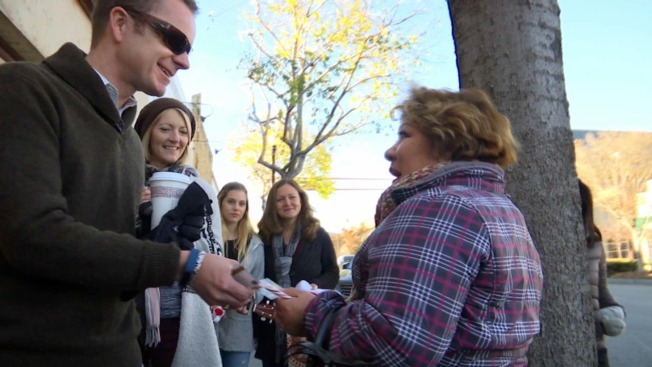 Tapping into the spirit of giving, a group of families from San Carlos zigged-zagged across the Peninsula city Saturday purchasing meals, distributing gift cards and spreading holiday cheer to stunned recipients. The annual gig, which completed its third go-around this year, is coined "Operation Joy" and it's all about bringing a smile to surprised strangers. "Sometimes you just see people walking along in their zone doing their own thing and you stop them and say, 'Merry Christmas,'" Judy Adams from San Carlos said. "'Wow, somebody actually spoke to me, someone was kind enough to think of me.' It's that kindness that people don't maybe get enough." Those behind the cheerful stunt even gave hungry McDonald's customers the ultimate "Happy Meal" by paying for their orders. The giving mood wasn't just confined to the Peninsula. Police officers in Mountain View woke up bright and early Saturday to give away toys to youngsters as well as collect backpacks and clothes for children in need.